Come Celebrate Govardhana Puja the "Sweet Hill Festival" - October 27, 2011 ~ The Toronto Hare Krishna Temple! 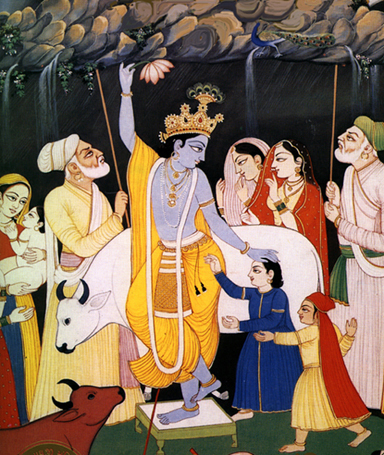 Tonight marks one of the biggest festivals of the year for Toronto's Hare Krishna community! 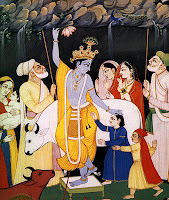 Govardhana Puja, also known as the "Sweet Hill Festival" marks the occasion when Lord Krishna lifted an entire hill like an umbrella to protect the residents of his village from torrential thunderstorms sent by the angered demigod, Indra (read more by clicking here). To celebrate this festival, we build a replica of Govardhana Hill made of various opulent foods, worship Lord Krishna as the lifter of Govardhana Hill, worship the hill as His incarnation, and worship the cows and bulls who are dear to the Lord. At the end of the festival, the hill of sweets is distributed to the public.